Christmas at Silver Dollar City is an experience that will last a lifetime. During the Christmas season the park is decked out in lights. In fact, with the new addition of 1.5 million lights, there are now over 6 million lights displayed in the park. Silver Dollar City has phenomenal Christmas shows playing throughout the day as well. From classics like “A Christmas Carol” to “It’s a Wonderful Life,” these shows will be sure to put a smile on everyone’s face. Christmas treats are also featured during this time. Try Silver Dollar City’s famous apple dumplings or roast a marshmallow and make a smore! Kids will be able to meet Santa Claus, Rudolph, Clarice, and Bumble. A special Christmas parade also concludes the night with Santa making a special appearance! 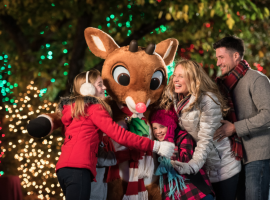 You won’t want to miss Christmas at Silver Dollar City! ibranson.com was born out of an idea to create the easiest and quickest way to book a Branson vacation.